Know Error became a vision when a feature story on NBC’s Today Show spoke about how “…a mislabeled tissue sample that led to a misdiagnosis, Darrie Eason had both of her breasts removed to save her from a cancer that she never had.” In October of 2007 the partners of Strand knew the forensic DNA matching technology could prevent this sort of mistake. With the DNA testing crime lab steps away the quest for patient safety began. 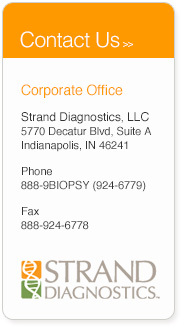 In 2008 Strand Diagnostics gained a CLIA accreditation to begin DNA testing (a buccal swab-to-biopsy tissue comparison) to make certain that the biopsy results belong to the patient being evaluated. The DNA test is referred to as DSPA (DNA Specimen Provenance Assay). The core features including bar-coding, forensic principles and DNA matching of the know error® system created a new level in cancer diagnostic accuracy. Today the patented know error® system has processed over 300,000 patients is widely offered to physicians, surgery centers and laboratories across the United States and Canada. Over 2,300 physicians routinely evaluate cancer diagnoses using the know error® system to enhance diagnostic accuracy and patient safety throughout the biopsy evaluation process. See this story and other Know Error features on our You Tube Channel.